Deposit taking institutions offer a broad range of deposit accounts to their clients varying in maturity, withdrawal conditions and interest rates. According to ECB statistics, the most of the deposit contracts have maturity less than 1 year. This page provides information on nominal deposit rates (quoted in deposit contracts) with agreed maturity up to 1 year in local currencies. inflation rate: real deposit rate can be calculated using expected inflation rates. Moody's country ceilings for deposits: it is a highest rating assigned to a bank or other deposit-taker domiciled in this country. Deposit rates are agreed annualised deposit rates of new deposit contracts with agreed maturity up to 1 year between credit institutions and households, the data are provided by European Central Bank	 , October 2018. Estimated annual percentages of average consumer prices in 2017, the data are provided by International Monetary Fund	 , World Economic Outlook. The data are provided by National Central Banks and Deposit Insurance Organizations. Moody's country ceilings for deposits (as of September 02, 2016) specify the highest rating that can be assigned to local- or foreign- currency denominated deposit obligations of a bank or other deposit taking institution domiciled within that country. Because the deposit rates are given for local-currency contracts, Moody's country ceilings for local currency are provided. Chart 1. 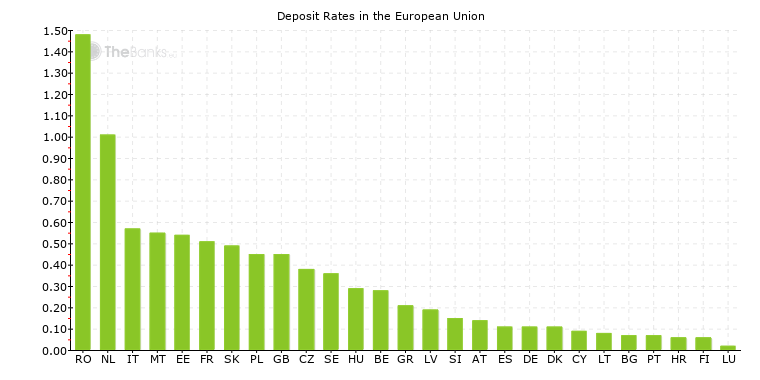 Deposit Rates (October 2018) in the European Union. Source: ECB.